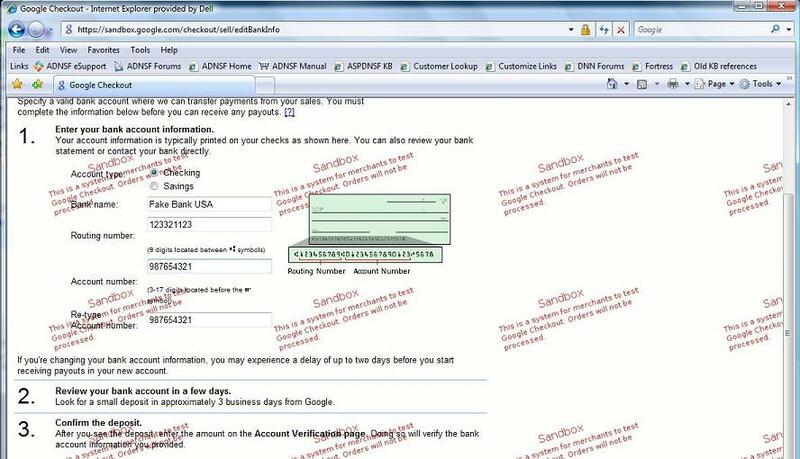 Google Checkout is an alternative payment method that many sites will want to offer to their customers. It allows the customer to checkout straight from the shopping cart page without going through the entire regular checkout process, and allows the customer to remain anonymous if desired. NOTE: The URLs and images shown in these directions are for Google's sandbox environment. 1. Navigate to http://sandbox.google.com/checkout and click the "Sign up now to start shopping" link. 2. Enter your personal and payment information to complete registration. NOTE: This will eventually be your merchant account login information. 3. Next, create your merchant account by going to http://sandbox.google.com/checkout/sell and logging in with the account you just created. NOTE: You may be asked to verify your email address at this point. 5. Enter your company's contact information and TAX info, and agree to the terms of service. 7. Fill out the banking information for your company and submit the form. 8. Now that the account information is complete, click "Tools" and then "Existing Carts" from the Google menus, then click AspDotNetStorefront.com from the list of existing carts. 9. Make note of the Google vendor ID and Google merchant key information shown, and then click on the "Settings" tab. 10. Click on the Integration link on the left, then uncheck the "My company will only post digitally signed carts" checkbox, and enter in your store's API Callback URL. This should be http://www.yourstore.com/gcCallback.aspx. 2. 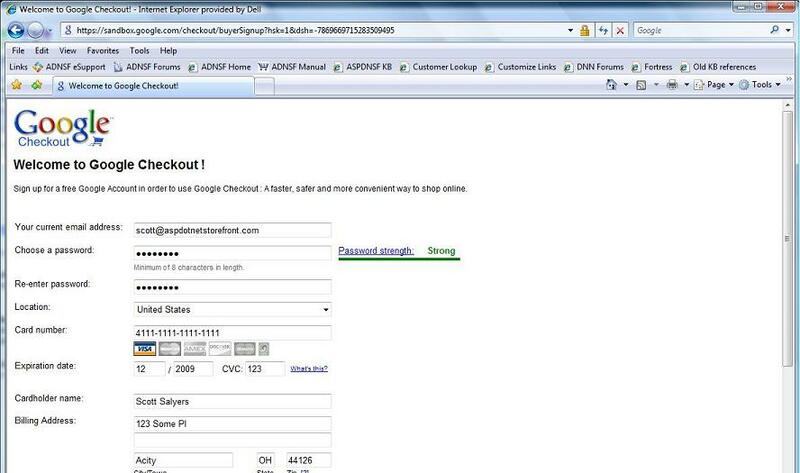 Ensure that the GoogleCheckout.ShowOnCartPage AppConfig is set to true. 3. 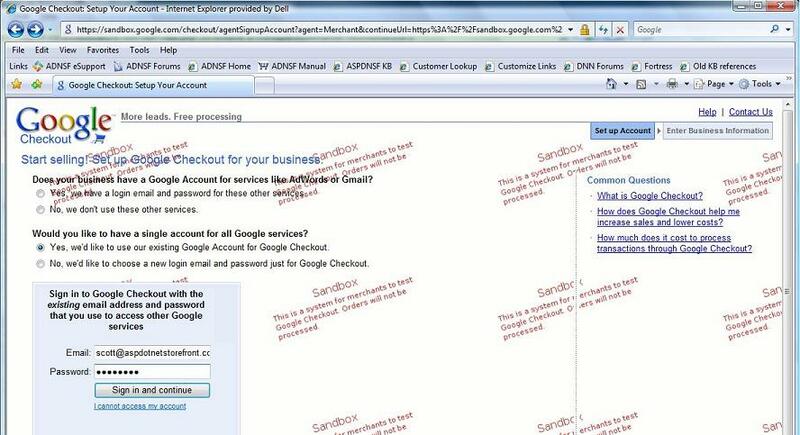 Verify that the GoogleCheckout.UseSandbox AppConfig is set properly for your site. If you are still doing testing, leave this value set to true. When you are ready to begin accepting live transactions, set it to false. AspDotNetStorefront Recommends: To conform with Google's integration guidelines, it is recommended to set the GoogleCheckout.AllowAnonCheckout AppConfig to true. This will allow customers to checkout without creating an account or providing any sensitive information to your site aside from a shipping address. 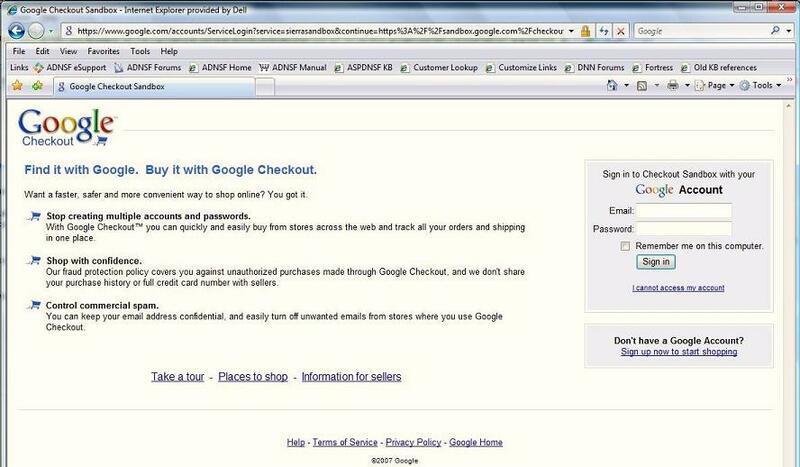 Google will even allow customers to communicate with store admins through a false email address to remain anonymous. While Google Checkout has its own built-in tax calculation feature, orders from AspDotNetStorefront software ignore those rates. If you need to charge your customers tax, you will have to set up tax rates within your software. See here for information on doing so. NOTE: This option is only available for US-based merchants. GoogleCheckout.CarrierCalculatedShippingEnabled If this is set to true, Google will calculate the shipping costs for you, based on the other AppConfigs listed here. If set to false, Google will use the rates set up on your site. GoogleCheckout.CarrierCalculatedDefaultPrice If you are having Google calculate your shipping rates, this value will be used if there is a technical issue on their end that prevents them from doing so. GoogleCheckout.CarrierCalculatedFreeOption The shipping method(s) you want to list as free (for orders that qualify), separated by a comma if there are multiple methods. The methods listed here must be contained in the list of methods selected in the GoogleCheckout.CarrierCalculatedShippingOptions AppConfig. GoogleCheckout.CarrierCalculatedPackage If you are having Google calculate shipping, it will use these dimensions for all orders when requesting rates. The following AppConfigs will need to be set if you are using merchant-calculated shipping rates. These values are used as default "ship to" addresses (for the purpose of generating rates only) if Google is not able to use the customer's address for some reason. Set these to an address far from your location, to ensure that a high enough shipping rate is quoted. NOTE: When using fixed-rate merchant-calculated shipping, you must set up separate shipping methods for domestic and international destinations, even if they are called the same thing and ship the same way. GoogleCheckout.DefaultShippingMarkup If using fixed shipping rates generated by your store, this markup percentage can be applied to Google Checkout orders. If no markup is desired, set this to 1.0. GoogleCheckout.LogFileName Specify a path (relative to the root of your site) and filename to save Google log information in if logging is enabled. GoogleCheckout.LogMessages Turn Google Checkout logging on/off. GoogleCheckout.SendStoreReceipt Determines whether or not customers get a receipt from your store in addition to the one they will get automatically from Google. If you experience problems with Google Checkout, first log into your Google Checkout account, and view the error log. That is available by clicking on the Tools tab at the top of the Google page, then clicking on Integration Console from the menu on the right. Each error will have its own entry in the list, and should give you some idea of what the problem is. If you are unable to determine the fix from reviewing those logs or the steps below, contact support. Q. I've set up Google Checkout, but when customers try to check out they are sent to my home page. 1. Verify that your MerchantID and MerchantKey AppConfigs do not contain any leading/trailing spaces or invalid characters. 2. Make sure you reset the cache after configuring Google Checkout, so the changes take effect. 3. Make sure your GoogleCheckout.UseSandbox AppConfig is properly set based on whether you're using live or test transactions. 4. 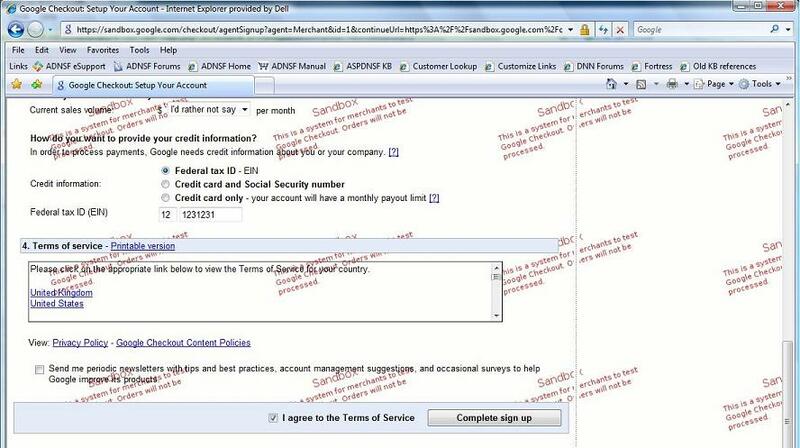 Verify that the GoogleCheckout.DiagnosticsOnly AppConfig is set to false. Q. My Google Checkout error logs say that they were unable to contact my server. Why are they doing that, and how do I correct this? A. Google Checkout contacts your server to notify you of a new order, or get information for a customer trying to place an order (shipping rates, taxes, etc). Be sure that a callback URL has been specified, as directed in step 10 of the setup directions above. Be sure that the URL begins with https (an SSL certificate must be installed), and that the URL allows anonymous access. Q. Do Google Checkout orders support ad-hoc transactions? A. Google does not support 'merchant-initiated' partial transactions. Store admins will need to do partial captures or partial refunds through Google's page. Q. What are the different ways that Google Checkout can provide merchants to offer coupons, gift certificates or discounts? A. One tool that merchants can use is the Merchant Calculations API. It computes discounts after the buyer reviews the order. If this option is used, the customer will have the option to enter coupon or gift certificates codes on the Google Checkout Place Order page. This also requires the merchant to create and operate a fast, highly reliable web service to computer discounts (this service can also calculate tax and shipping costs). For more information, checkout the Merchant Calculations API page. Note: Merchants in the U.K. cannot yet use the Merchant Calculations API to calculate coupons or gift certificates. - You can specify a coupon code to identify the offer. - You can specify a discount value as an absolute amount (in dollars or British pounds). - U.S. merchants can also specify a discount as a percentage of the order total. The discount will be provided before taxes or shipping charges are added to the order total. - For U.K. merchants, the discount will be applied after taxes and shipping charges are added to the order total. - You can specify that the coupon may only be used if the order total exceeds a specified amount. - You can limit the number of times that each customer can use the coupon. - You can make the coupon available to all customers or only to customers who have never purchased from you through Google Checkout. - Buyers can enter one coupon per order for coupons created through the Google Checkout Coupon Creator. - Lastly, the merchant can pass the discount as a separate item in the buyer's shopping cart with a negative price. This technique limits discounts to a fixed value.